HOOK N’ LOOK DIVES INTO DEEP BLUE COFFEE! Considering the names of some of Deep Blue Coffee’s hand-crafted blends, Traverse City Bass Blend, Anglers Blend, Great Lakes Blend, Hook N’ Look is especially proud to announce a promotional agreement with the Traverse City, Michigan based coffee company. Each custom roasted blend displays a satisfying richness which will please any palate. Try some for yourself! We’re thoroughly confident you’ll agree that Deep Blue Coffee is unforgettably delicious! This Thanksgiving, I have a lot to be thankful for. An incredible amount, really! At Sport Fish Michigan, we are extremely blessed and lucky. We get to do what we love—we get to fish for a living, taking people out on the water for a memorable fishing adventure in the form of guide trips and charters, and we get to experience these memories with our customers as they happen. Not only this, but we are fortunate to be booked almost every single day of our seasons. And no bluffing here—we have tremendous customers! From our Traverse City Bass Guide Service, Manistee River Salmon Guide Service, Wolfe Outfitters and on behalf of the others at our statewide network of the top Captains and guides, please accept our very heartfelt THANK YOU. Thank you for a wonderful season. Thank you for your generosity. Thank you for helping to make our jobs a pleasure. Thank you for making our fishing seasons wildly successful yet again. Thank you for being such loyal customers, and thank you for your continued support and interest in our services. We look forward to having you aboard our boats next year, and wish you all the best until we have the pleasure of fishing together again. The weather forecast for Thanksgiving looks like it’s going to be close to 60 degrees and sunny. Perfect for a day of fun fishing. And if that happens—I’ll be even more thankful. 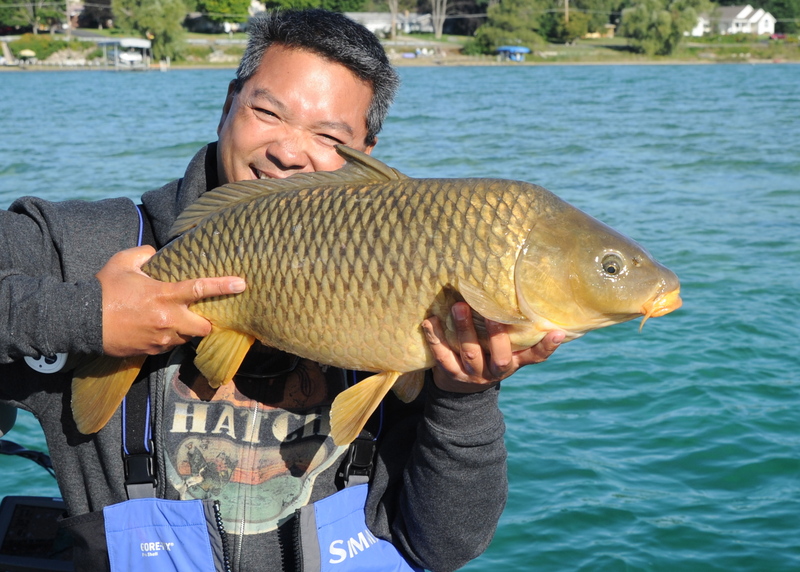 Yup, it’s a bruiser carp from Grand Traverse Bay. And what a fun fight!!! I had an interesting grocery shopping experience two days ago when I went to pick up some groceries at a Meijer’s in Traverse City. A super blustery day, where it was a pleasure to not have a guide trip on a much-enjoyed day off, I ventured out to pick up some groceries for upcoming guide trips as well as forage for ingredients for dinner. As I was looking for a parking spot, in the always-busy Meijer’s, the friendly face of a long-time local customer of mine called out “Hello Captain!” This was a customer, Chuck, who has fished with me on two of my guide services. I have enjoyed fishing with he and his grandson, Logan, on my Traverse City Bass Guide Service, targeting smallmouth bass, and have also enjoyed fishing with he and his wife, Janis, with my Manistee River Salmon Guide Service down in Manistee, Michigan targeting king salmon. Chuck and I chatted briefly, catching up on the fishing and life in general. It was fun running into such a nice customer, and glad to hear that things continue to go well for him in his retirement. While getting a hot cider, a woman recognized me from my television segments on WWTV’s Michigan This Morning show where they highlighted my 3 guide services and my Deep Blue Coffee Company. She asked how the fishing business was, and we spoke about a friend of hers who is a fishing guide in New Zealand. She was happy that I had been highlighted, saying that she thought that I had done a great job. Much appreciated praise, thank you! Overhearing our conversation was a gentleman who asked about my coffee company. It turns out that this guy’s family owns a coffee farm in Hawaii, and owns a coffee shop/roastery in Homer, Alaska. 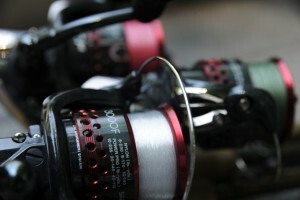 We spoke a bit about the coffee business, and as many of my conversations do, we also spoke about fishing. What a small world, because not only does his family own a coffee farm and shop, he is here in the Traverse City area to attend the Maritime Academy. His love is on the water, and Traverse City seemed to be a great fit for him. Spending so much time on the water isolates me a bit, but it’s days like I had a couple of days ago that remind me how small a world it actually is, and how we are all connected. Running into Chuck prompted me to put up a photo of a trip with his grandson Logan and one from a trip he had with Janis, fishing for salmon. Thank you everybody, for making my passion my job, and for making my job such a pleasure. 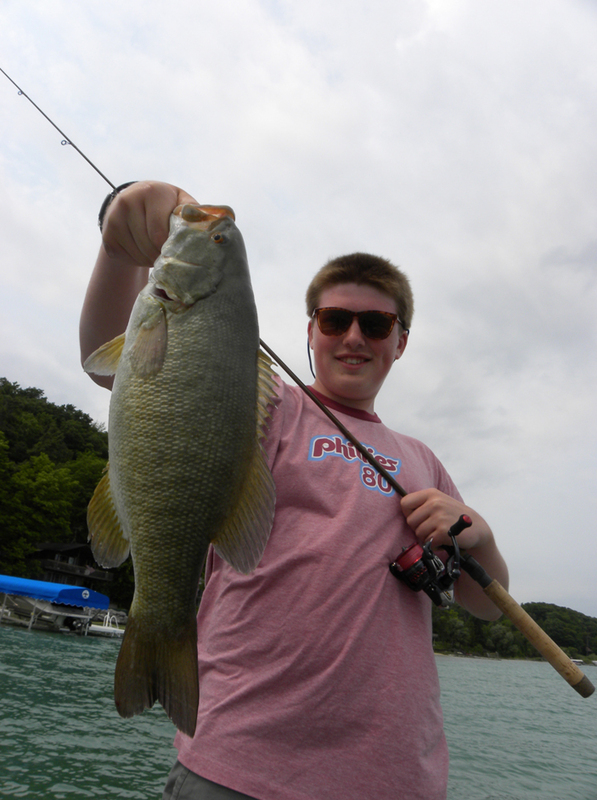 Chuck’s grandson Logan with a dandy smallmouth he caught while fishing with me at Traverse City Bass Guide Service. 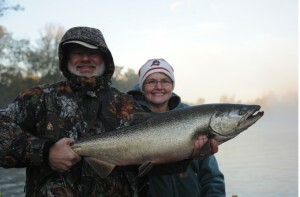 Chuck and Janis with a king salmon caught while fishing with Manistee River Salmon Guide Service. Just because you can’t go doesn’t mean that I’m not going to go. This scenario happened several days ago when one of my Sport Fish Michigan Captains, Andy Odette and I went out for a few hours of fun fishing after a 3 boat trip cancelled. With extremely rough seas predicted for the actual scheduled day, I tried to see if the party of 17 was able to switch days to a day earlier in order to take advantage of the calm Indian Summer afternoon that we were experiencing here in northern Michigan. Here for a corporate retreat, the party of 17 initially seemed interested in switching afternoons to take advantage of the calm weather, but ultimately were unable to do so. 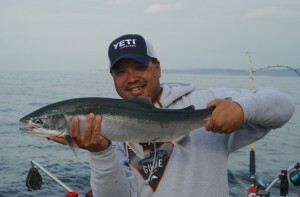 Disappointed in not being able to showcase the awesome late October bite that the Frankfort area provides to our 17 person party, Captain Andy and I decided to not waste the afternoon by not heading out for a couple of hours just for fun. Joined by another one of the Captains that would have been a part of the 3-boat trip, we headed out onto the near-pancake flat waters of Lake Michigan. 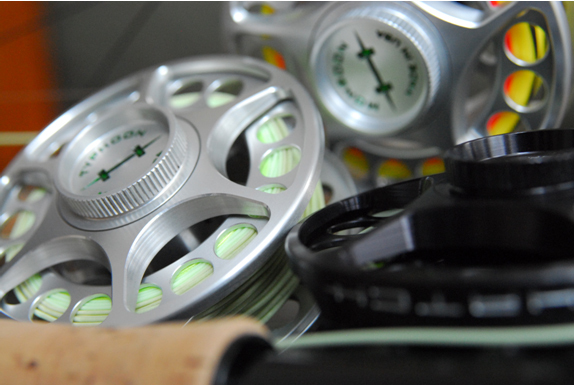 Using a variety of presentations, trying to take advantage of the upper water-column feeding that steelhead are notorious for, we put out multiple options in the top 15 feet. Steelhead are partial to orange, and our spreads included a lot of oranges, oranges and blacks, oranges and chrome and oranges and greens. 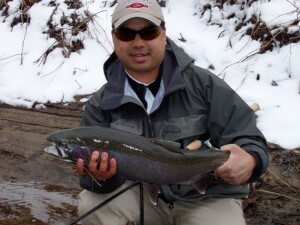 Although we missed our first steelhead bite on a planer board, we knew we were onto something, having only had a line in the water for 10 minutes or so. Despite the variety of presentations that we were using, only 2 seemed to be getting the bulk of the attention. 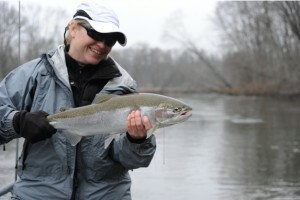 Sure, we got a nice steelhead on a downrigger, set 12 feet down, and got a couple of bites on a few other spoons, but interestingly, it was 2 of the more unexpected presentations that seemed to catch the most fish. One was a plain chrome spoon that had all of the paint knocked off, and the other was a tiny little casting spoon in a perch pattern. The go-to spoons yielded nothing. All this goes to show is how effective trolling a large variety spread can be when trying to refine a pattern, and also how unpredictable fish can be. What we thought would work didn’t. 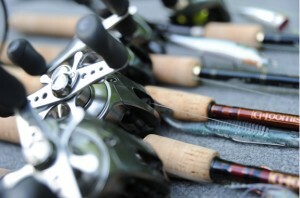 What we as anglers were indifferent about, turned out to be the key, with the fish responding very well. 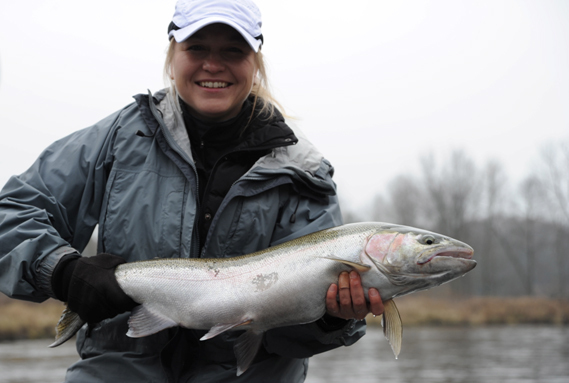 In all, we landed our limit of steelhead in short order, and adjusted our presentations to target 3-year-old king salmon, which we were seeing on our electronics. It was a true pleasure to be able to get out for a couple of hours to just “fun fish”. It was a shame that our 3 boat trip had to cancel, and couldn’t take advantage of the wonderfully pleasant conditions, but such is the case. Just because they couldn’t go didn’t mean that we couldn’t! 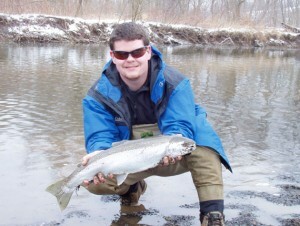 A couple of productive hours out on the water catching fall steelhead certainly beats sitting at the dock dreaming!